This blog post is co-authored by Emmanuel Bertrand, Senior Program Manager, Azure IoT. 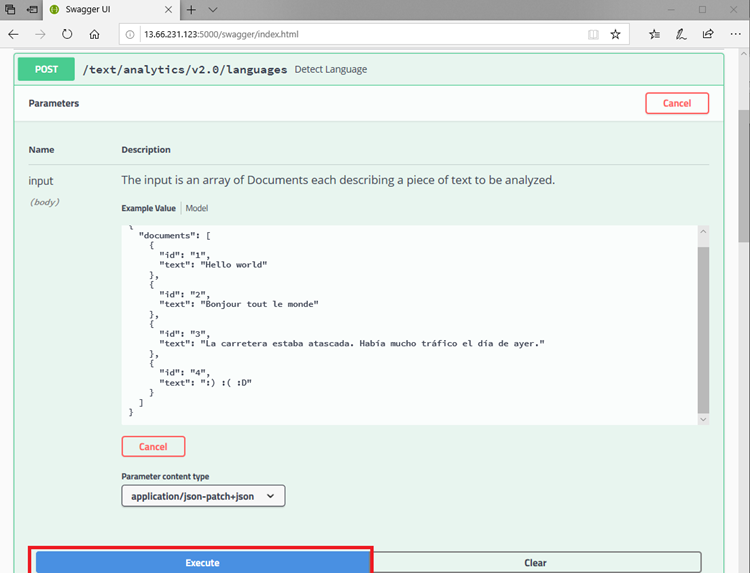 Today, we are happy to announce the support for running Azure Cognitive Services containers for Text Analytics and Language Understanding containers on edge devices with Azure IoT Edge. This means that all your workloads can be run locally where your data is being generated while keeping the simplicity of the cloud to manage them remotely, securely and at scale. Whether you don’t have a reliable internet connection, or want to save on bandwidth cost, have super low latency requirements, or are dealing with sensitive data that needs to be analyzed on-site, Azure IoT Edge with the Cognitive Services containers gives you consistency with the cloud. This allows you to run your analysis on-site and a single pane of glass to operate all your sites. 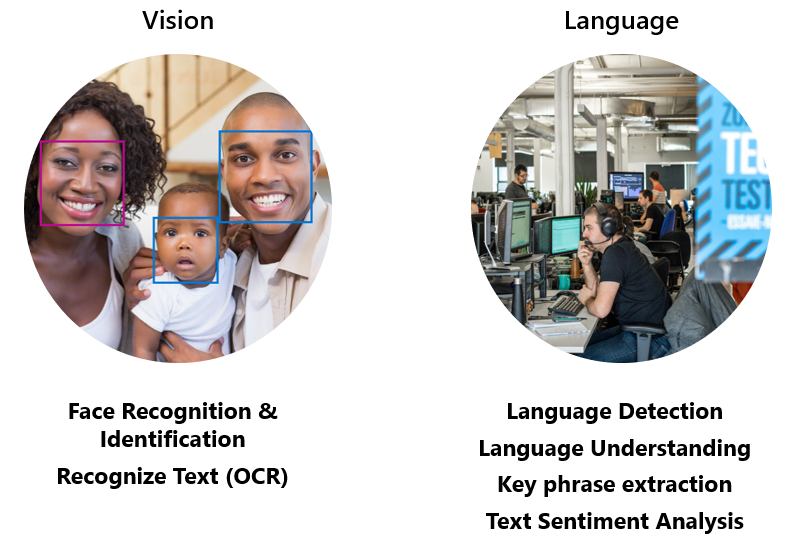 Language Understanding applies custom machine learning intelligence to a user’s conversational and natural language text to predict overall meaning and pull out relevant and detailed information. Please note, the Face and Recognize Text containers are still gated behind a preview, thus are not yet available via the marketplace. However you can deploy them manually by first signing up to for the preview to get access. 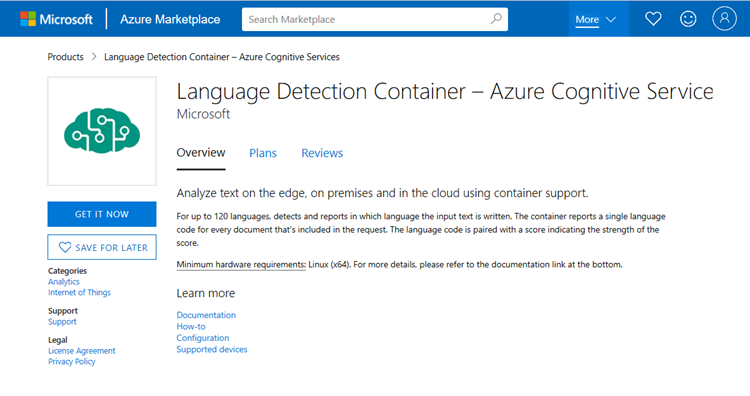 In this blog, we describe how to provision Language Detection container on your edge device locally and how you manage it through Azure IoT. Currently these containers run only on X64 based devices. Follow the first steps in this quick-start for setting up your IoT Edge device and your IoT Hub. It first walks you through creating an IoT Hub and then registering an IoT Edge device to your IoT hub. Here is a screenshot of a newly created edge device called “LanguageDetection" under the IoT Hub called “CSContainers". Select the device, copy its primary connection string, and save it for later. Next, it guides you through setting up the IoT Edge device. If you don’t have a physical edge device, it is recommended to deploy the Ubuntu Server 16.04 LTS and Azure IoT Edge runtime virtual machine (VM) which is available on the Azure Marketplace. It is an Azure Virtual Machine that comes with IoT Edge pre-installed. The last step is to connect your IoT Edge device to your IoT Hub by giving it its connection string created above. To do that, edit the device configuration file under /etc/iotedge/config.yaml file and update the connection string. After the connection string is update, restart the edge device with sudo systemctl restart iotedge. The images are directly available as IoT edge modules from the Iot Hub marketplace. 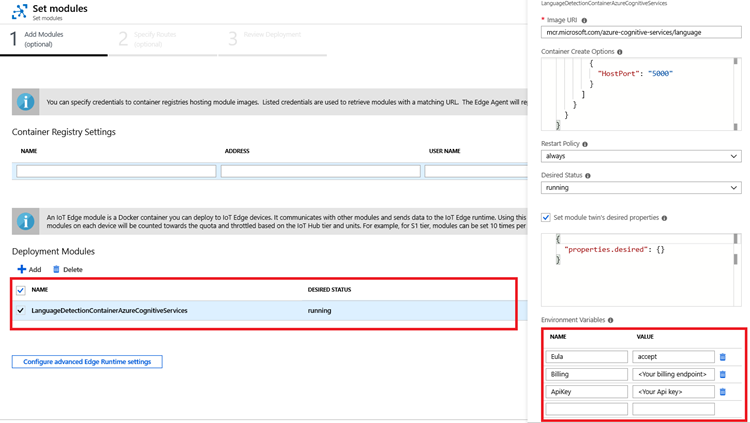 Here we’re using the Language Detection image as an example, however other images work the same way. To download the image, search for the image and select Get it now, this will take you to the Azure portal “Target Devices for IoT Edge Module” page. Select your subscription with your IoT Hub, select Find Device and your IoT Edge device, then click the Select and Create buttons. 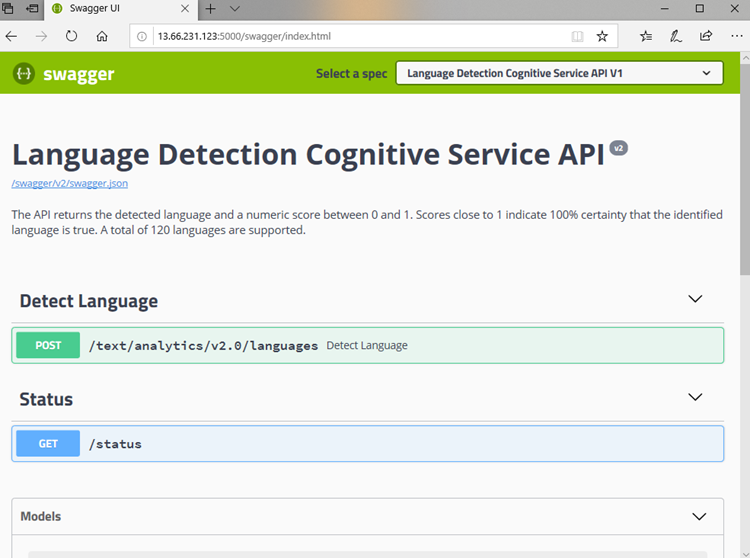 Now you’re almost ready to deploy the Cognitive Service to your IoT Edge device. But in order to run a container you need to get a valid API key and billing endpoints, then pass them as environment variables in the module details. The endpoint is strictly used for billing only, no customer data ever flows that way. Copy your billing endpoint value to the “billing” environment variable and copy your API key value to the “apikey” environment variable. 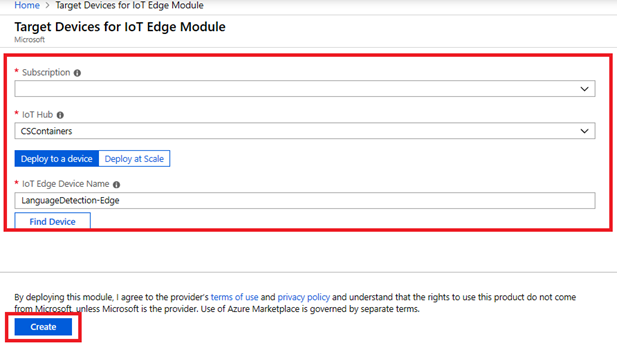 All required info is now filled in and you only need to complete the IoT Edge deployment. Select Next and then Submit. Verify that the deployment is happening properly by refreshing the IoT Edge device details section. 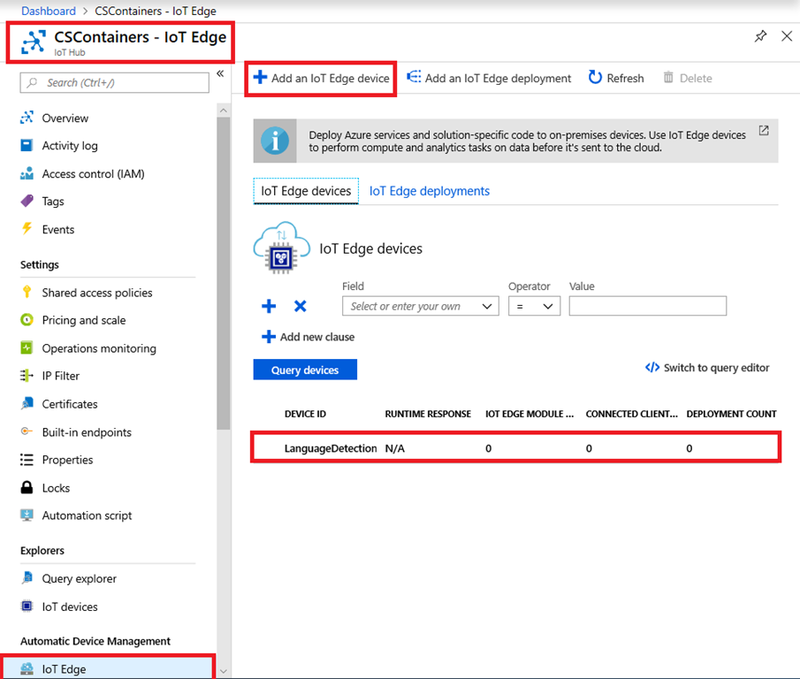 Verify that the deployment is happening properly by refreshing the IoT Edge device details section. To try things out, we’ll make an HTTP call to the IoT Edge device that has the Cognitive Service container running. For that, we’ll first need to make sure that the port 5000 of the edge device is open. If you’re using the pre-built Ubuntu with IoT Edge Azure VM as an edge device, first go to VM details, then Settings, Networking, and Outbound port rule to add an outbound security rule to open port 5000. Also copy the Public IP address of your device. Now you should be able to query the Cognitive Service running on your IoT Edge device from any machine with a browser. Open your favorite browser and go to http://your-iot-edge-device-ip-address:5000. 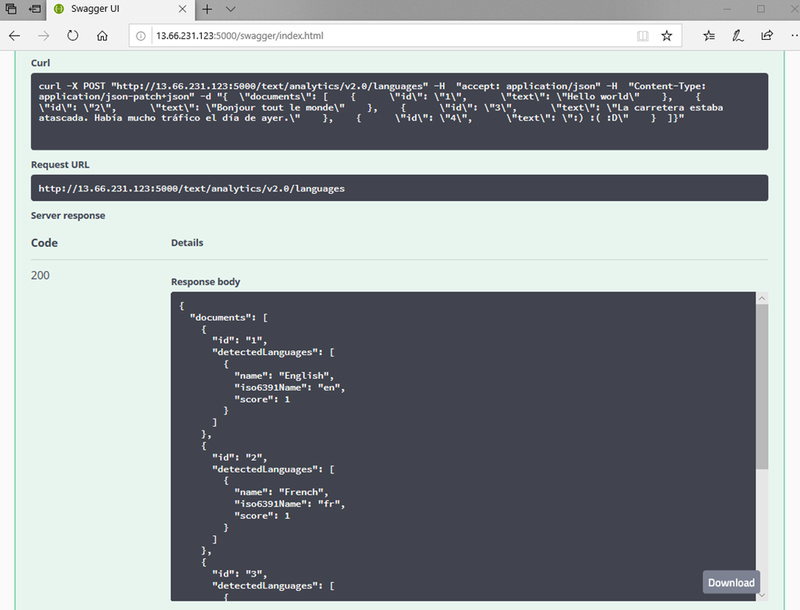 Now, select Service API Description or jump directly to http://your-iot-edge-device-ip-address:5000/swagger. This will give you a detailed description of the API. You are now up and running! You are running the Cognitive Services on your own IoT Edge device, remotely managed via your central IoT Hub. You can use this setup to manage millions of devices in a secure way. 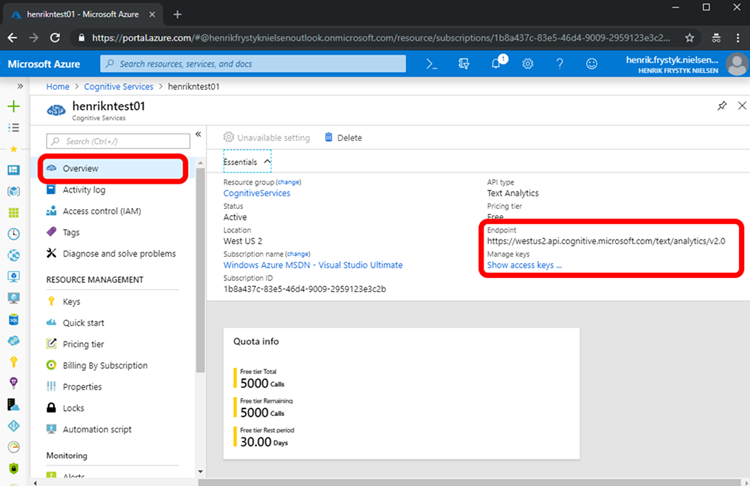 You can play around with the various Cognitive Services already available in the Azure Marketplace and try out various scenarios. Have fun!